It has been nearly two weeks since I mentioned that I was going to begin using probiotics for digestive health and I have to admit that the concept was one that was met with a bit of pessimism and quite the lack of enthusiasm from my husband. 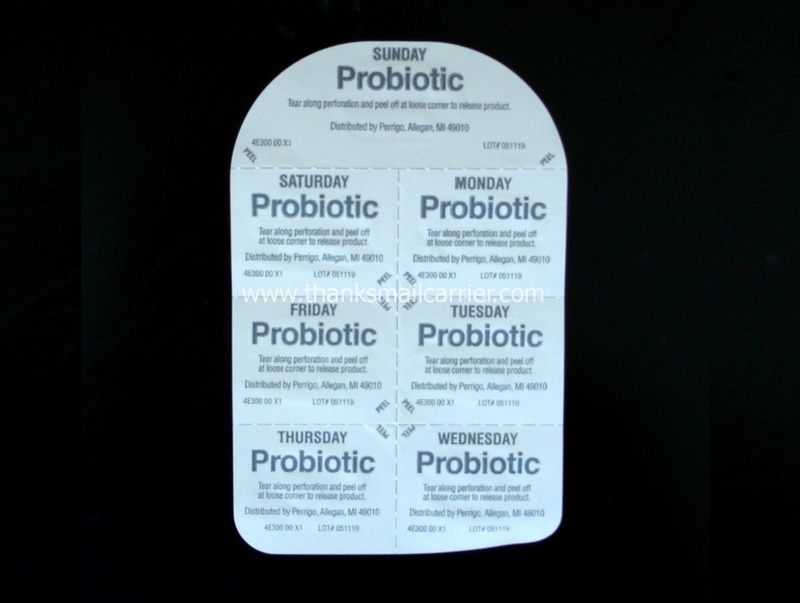 Not that he has anything against probiotics as a whole, but he pointed out more than once that due to the fact that I had never experienced any digestive health issues in the past, that I was crazy for making this change. I wasn't really all that surprised that his Why mess with something that isn't broken? mentality had extended to Member's Mark 4X Probiotic, as he is skeptical by nature, but that didn't stop me in the slightest. 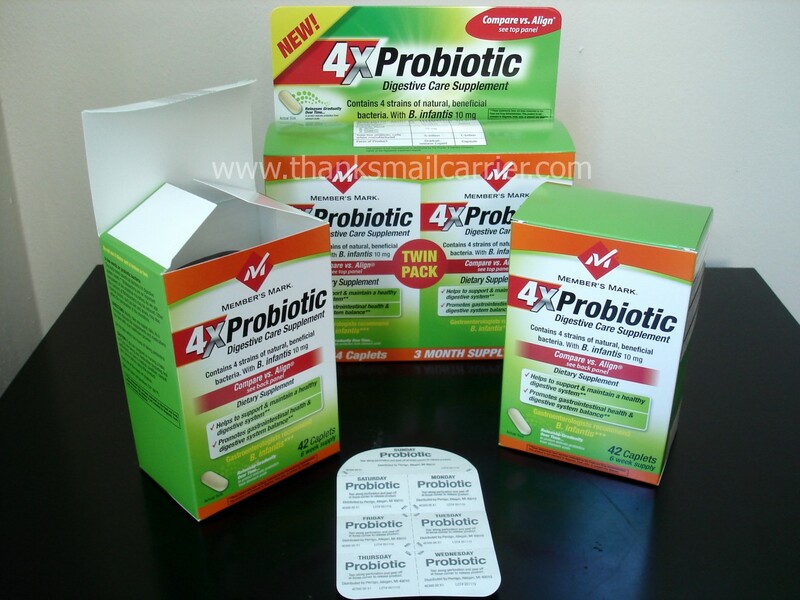 As I previously mentioned, I've never tried a digestive health care supplement before but have heard endless good things about probiotics and how these bacteria can help maintain a healthy digestive system. Knowing that these caplets don't require anything more than swallowing one once a day and they will release gradually over time, well, who was I to turn down possible benefits? What I found was that I did indeed appreciate the individual packaging that I had first noticed, as having each one labeled with a specific day of the week made it simple to check and see if I had remembered that day or not. For anyone who is forgetful, busy or a combination of both, this is a very convenient feature! So... what are my results after nearly two weeks? I have to admit that so far, not much. I wasn't sure what I was expecting, considering I wasn't having stomachaches or bloating or any other digestive health issues, but things seemed to have stayed the same. I did miss a few days in the middle of this trial period due to being out of town at BlogHer (I wasn't going to risk anything while being 2,000 miles away from home), but otherwise I've been staying on schedule of taking one caplet daily. Considering that Member's Mark 4X Probiotic contains four strains of natural beneficial bacteria to help support and maintain a healthy digestive system and that I have heard all positive results from many other people who have tried it (check out #digestivehealth on Twitter for other great blog posts), I plan on continuing for the next few months and seeing if a longer time period makes a difference. I don't always make the best food choices and we all have too much stress in our lives, so ignoring our digestive system is not the way to go! Whether you just want to boost what you do to take care of your body or if you've been experiencing digestive health issues that need resolving, you can find out more about Member's Mark 4X Probiotic at your local Sam's Club. This shop has been compensated as part of a social shopper insights study for Collective Bias but all thoughts and opinions are honest and my own. Good for you for trying - I'm sure your tummy appreciated it!